Do you enjoy watching kitchen reality shows? Millions of viewers all over the globe love to watch better reality shows during prime time and therefore they wait for better shows that can help them to spend better time when they return home. There are many prime time shows that are happening all over the world but there are certain shows that have created better hype when they were first premiered. Food Networks have always come up with better kitchen based shows that have gained better viewer response and therefore they are doing it again with Chopped All Stars. Food Network Chopped All Stars is back on TV from this month and you can expect some really serious drama unfolding as top chefs battle against each other to be the winner for the episodes. 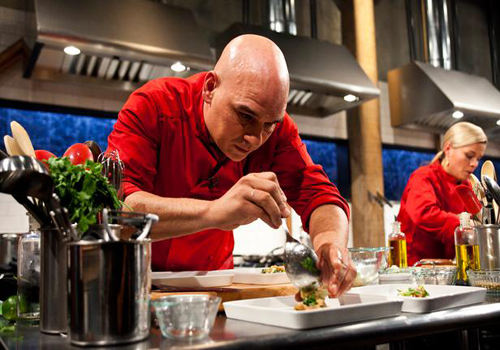 Food Network believes that like the first season, the second season of Chopped All Stars will get better ratings and will be loved by the audiences in the United States. The first season of Chopped was premiered in 2009 which was hosted by Ted Allen. This time again it will be Ted Allen that will host the show and introduce the chefs and the judges. This time around Chopped All Stars will have some of the top chefs that have participated in various cooking challenges like Iron Chef and therefore it will be a better competition compare to the first season. There will be five themed episodes where chefs will have to compete to be the winner. The winners of the episodes will then battle against each other to win the grand prize of $50,000 and the title. The winners will be judged by top chefs like Anne Burrell, Scott Conant, Aaron Sanchez, Geoffrey Zakarian and Amanda Freitag. The final episode of the competition will be telecast on Sunday, May 6, at 9 pm ET/PT. I think people are not going to like this one because the first season was not that great. I am going to like this one because anne burrell is in the show, she is really the best one in the US chef.